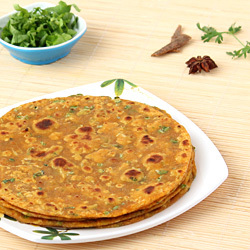 Stuffed Mooli Paratha is yummy shallow fried Indian bread belonging to Punjabi cuisine. 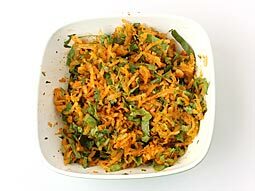 This easy recipe uses stuffing prepared with shredded mooli, mooli leaves and various other spices. It is a perfect, easy to carry dish for long journeys and picnic and brings a welcome break from routine stuffed alu paratha as it has little spicy touch. 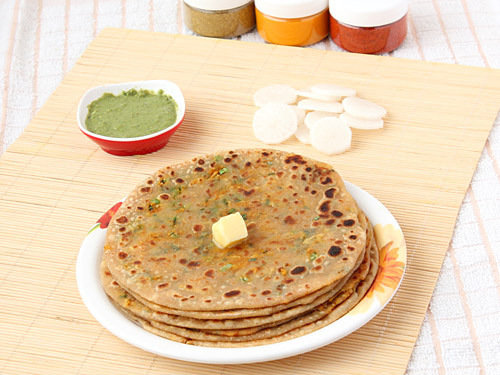 You can also prepare its plain version (without stuffing) at home by following simple muli paratha recipe. 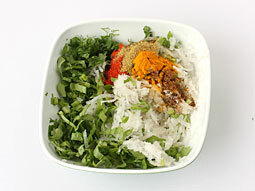 Note: First grate the muli, squeeze the grated muli to remove excess water and then use that water to knead the dough. Prepare the stuffing after kneading the dough. 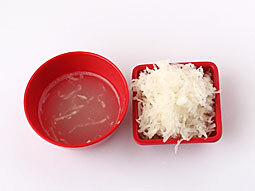 Squeeze the grated muli to remove excess water. 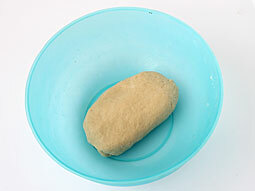 Keep removed water in a small bowl; it will be used in next step to knead the dough. Take squeezed mooli, chopped mooli leaves, chopped green chilli, red chilli powder, garam masala powder, turmeric powder and coriander powder in a bowl. Mix them properly. Stuffing is ready. Divide it into 6 equal portions. Take 1½ cup wheat flour, 2 teaspoons oil and salt to taste in a bowl. 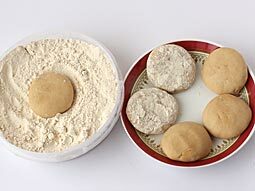 Knead smooth and soft dough using water squeezed from shredded mooli. If required, add additional normal water. Cover it with a plate and rest it for 10 minutes. Take 1/2 cup wheat flour in a plate for dusting/coating. After 10 minutes, knead dough again and grease the surface of the dough with 1 teaspoon oil. Divide it into 6 equal parts and give them a round shape of ball. Press each ball a little between your palms to give a shape of pattie. Coat it with dry wheat flour. 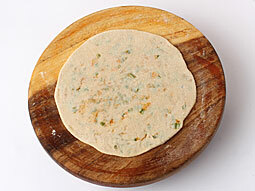 Place one pattie on roti making board (chakla) and roll it out into a circle having approx. 4-5 inch diameter. Put one portion of prepared stuffing in the center. 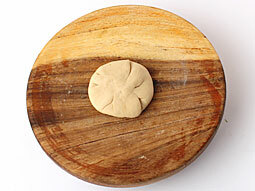 Coat it with dry wheat flour and roll it out carefully into a circle having approx 6-7 inch diameter. Heat a tava over medium flame. When it is medium hot, place rolled paratha on it. When the tiny bubbles appear on the surface, flip it. Spread 1/2 teaspoon oil over the surface with the help of spatula and cook for 30 seconds. Flip it and repeat the same process of spreading the oil and cook for 30-45 seconds. Repeat flip and cook process until light brown spots appear on both sides. Stuffed paratha with mooli is ready. Transfer to a plate and spread butter over it. Serve with mint chutney and tomato raita. Do not keep stuffing mixture idle for too long after mixing all ingredients otherwise it may become watery. If stuffing starts to release water, then squeeze out excess water again. 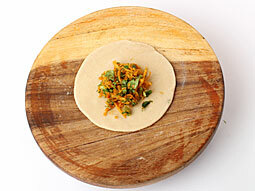 Serving Ideas: Serve it with pickle and raita as healthy breakfast. Due to stomach filling nature of stuffed parathas, it can be served in dinner or lunch with classic aloo gobi masala or any of your favorite Indian curry. 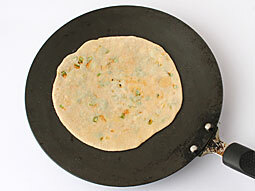 I tried all paratha recipes, its very good and healthy, well done. Very easy recipe and very tasty too. Thank you so much. Too good a recipe! My family enjoyed the dish! 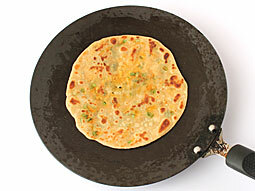 Among all the parathas stuffed with veggies, the mooli / daikon is perhaps the best. One variation of this recipe that I tried was to incorporate the prepared mooli into the dough during the mixing process rather than stuffing it. I did use my Breville stand mixer as it makes the mixing of the dough with the veggies much easier on your hands and the end result was evenly stuffed parathas. Very good recipes. World’s best recipe website. Today I tried this recipe. I sautéed reddish for few minutes and then squeezed excess water. Then I added finely chopped coriander leaves for variation. It tastes yummy. Thanks chef. One of the Best Recipe site I ever came across. Keep it up. All the Best.